On Saturday night I rolled myself off the couch so that Andy and I could go out to a celebratory dinner at Spice Kitchen & Bar — we sold our house! we reached 37 weeks pregnant! Before dinner we decided to take some super awkward photos to document this exciting time in our lives. The more awkward the better! I’ve officially moved past the “cute” part of pregnancy. Now it’s double chins and sausage fingers, and don’t even look at my ankles…. or where my ankles used to be. Eesh! Haha. (Having a cold doesn’t help either, because then I just add a red nose to the mix, ha!) There was a lot to be happy about this weekend, though, double chins and all, and we had an amazing dinner. I think Spice is one of the best restaurants in Cleveland, and that’s saying a lot. WEEK: 37 weeks down / less than 3 to go. We made it! At 37 weeks, a baby is no long considered premature, so while this burrito still has about 2-1/2 weeks to get completely cooked, she can come anytime without any major concerns. So far she isn’t showing any signs of wanting to come early, though. FEELING: Ready! All the baby stuff is unpacked, washed and put away. The carseat is installed and inspected. Our hospital bag is packed. Tiny diapers are lined up on the changing table. There are frozen meals in the freezer. We had our final child prep class on Monday. Today I’m getting one last haircut and color. So we’re as ready as we’ll ever be! Now we can just relax until baby decides she’s ready, which we’re in no hurry for. DOING: Unpacking! We finally moved the last of our stuff last week, so we’re working on putting everything away and making our house feel like home. It’s soooo great to have all of our stuff under one roof and I loooove seeing everything come together. I can’t lift anything heavy, but I’m really good at pointing to where it should go! EATING: Oatmeal! It had been years since I had a good old fashioned little packet of oatmeal — maple and brown sugar, of course! — but that stuff is delicious, right? I make my oatmeal with water AND milk. Is that weird? CRAVING: There’s a box of devil’s food cake mix in our kitchen that I can’t stop thinking about. I might try making it with some of this… has anyone ever tried it? WEARING: Whatever I can find that will sort of cover my tummy, which means yoga pants and one of maybe three shirts that kind of work… Did you know that you can outgrow maternity clothes?! Whaaat?? 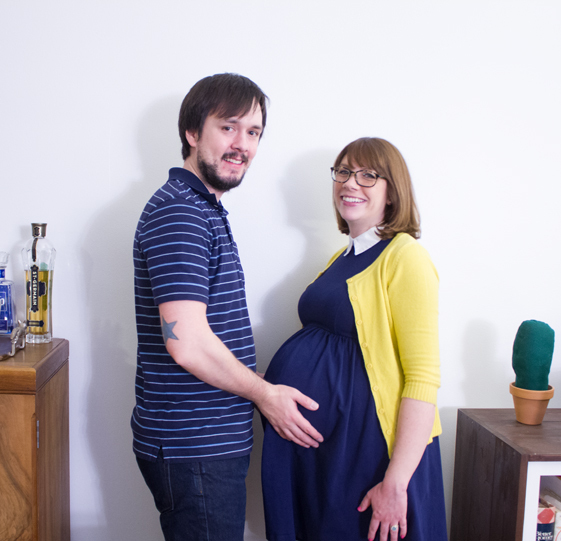 LOVING: We’re so close to meeting this little burrito who is due in just 17 days! It’s so exciting to know how soon we’ll finally be able to see her and get to know her. You’re looking great. Happy days ahead. Can’t wait to see baby girl. Do you have names picked? Someone I know just went for a check at 38 weeks 1 day and it doesn’t seem like the baby’s in any hurry to make an appearance. Enjoy this time before Baby makes her appearance as much as you can!